Christopher Columbus, Epistola de insulis nuper inventis. With: Carolus Verardus, Historia Baetica. Basel: Johannes Bergmann de Olpe, 1494. 209 x 150 mm. With 6 woodcuts by the Master of Haintz Narr. 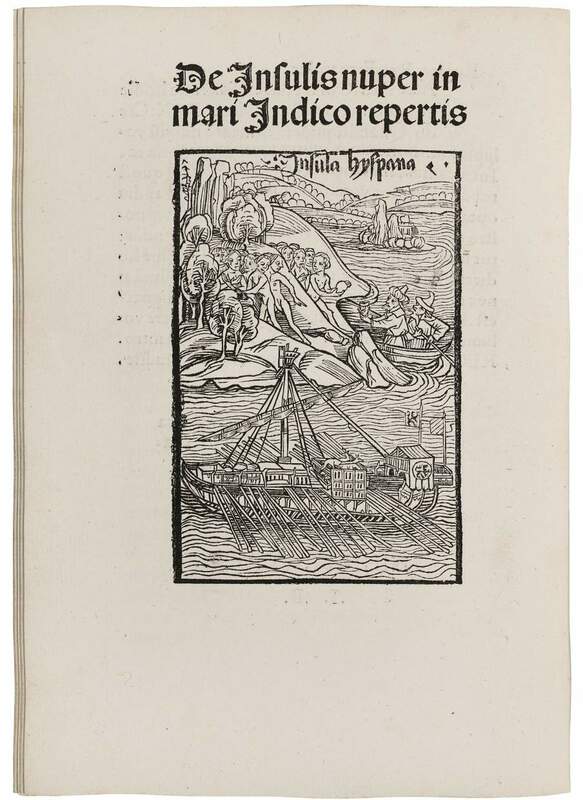 Second Basel edition of Columbus’ first account of the discovery of the New World. Preceded by: Carolus Verardus, Historia Baetica. 209 x 150 mm. – 36 leaves. With 6 woodcut illustrations. On his return from the newly discovered "Indian" isles in March 1493, Columbus addressed several letters to the Catholic monarchs Ferdinand of Aragon and Isabella of Castile, who had financed his expedition, and sent a report to his patron, Luis de Santángel, in which he confirmed that the land he had discovered met all the hopes and expectations attached to this expensive and risky expedition. First printed in Barcelona in April 1493, this letter was immediately translated into Latin and several editions appeared in the same year in Rome and other cities. Unlike all the other published editions of Columbus's letter, the present Basel edition of 1494 was printed in conjunction with a second text, Verardus' Historia Baetica, a historical drama in Latin prose that praises the Spanish monarchs Ferdinand and Isabella for the conquest of Granada. This edition contains six remarkable woodcuts, three of which illustrate the New World. The preceding Basel edition of 1493 is the first to contain illustrations; those four woodcuts were re-used in the present edition. While the almost full-page woodcuts provide a rather stylized view of the Bahamas and the Caribbean islands and their inhabitants, they remain nonetheless spectacularly important as the first European depictions of the New World.